The Type Archive holds the National Typefounding Collection, purchased with grants from the National Heritage Memorial Fund; broadly comprising; 1. the typefounding materials of the Sheffield typefounders, Stephenson Blake, a collection dating from 16th century London typefounders to their 20th century counterparts; 2. the hot-metal archive and plant of the Monotype Corporation, operating from Salfords in Surrey from 1897, and in London's Lambeth from 1992 to date; and 3. the Woodletter pattern collection and plant of Robert DeLittle in York from 1888, and in Lambeth from 1996. 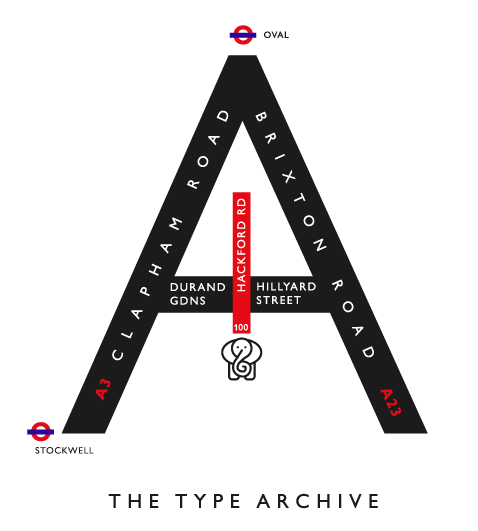 The Type Archive holds the National Typefounding Collection, purchased with grants from the National Heritage Memorial Fund; broadly comprising 1. the typefounding materials of the Sheffield typefounders, Stephenson Blake; 2. the hot-metal archive and plant of the Monotype Corporation; and 3. the Woodletter pattern collection and plant of Robert DeLittle. Our handsome industrial buildings in London sw9 0qu were leased by the Church Commissioners to veterinary surgeons Prince & King in 1895. The two brick buildings remain sound, full of character and largely untouched, with cobbles on the first floors, rings in the walls and yard cobbles stamped 'Queen Victoria Diamond Jubillee 1837-1897'. The vestiges of the horse ramp's canopy can still be discerned along an outside wall. The site has a colourful past. In 1912 the buildings were described in the local press as a ‘Hotel for 4 legged Animals,’ specialising in the regular care of sick horses and dogs, and providing seasonal accommodation for small circus animals, including baby elephants and a baby zebra. In 1912 the Daily Mirror became a customer from May to December, and brought two baby elephants from India as mascots for a charity for poor children. The baby elephants were cared for by a specialist from Canada. 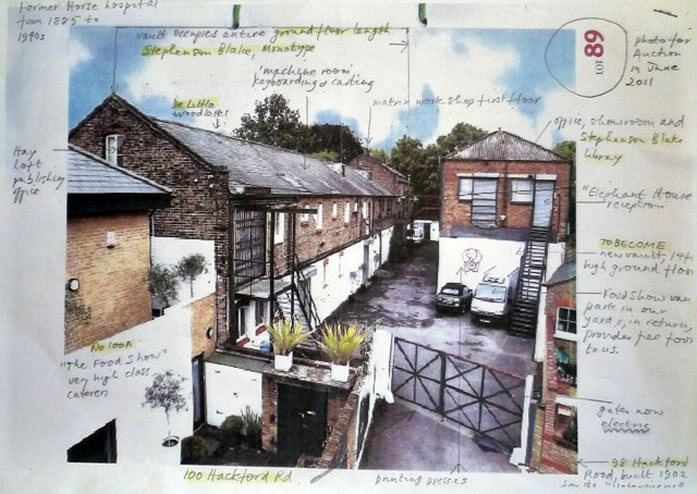 At present our overriding concern is to regenerate the 14 feet high ground floor of the Elephant House (the tall separate building to the right of the site) to become a custom-built new vault, with public and research access. 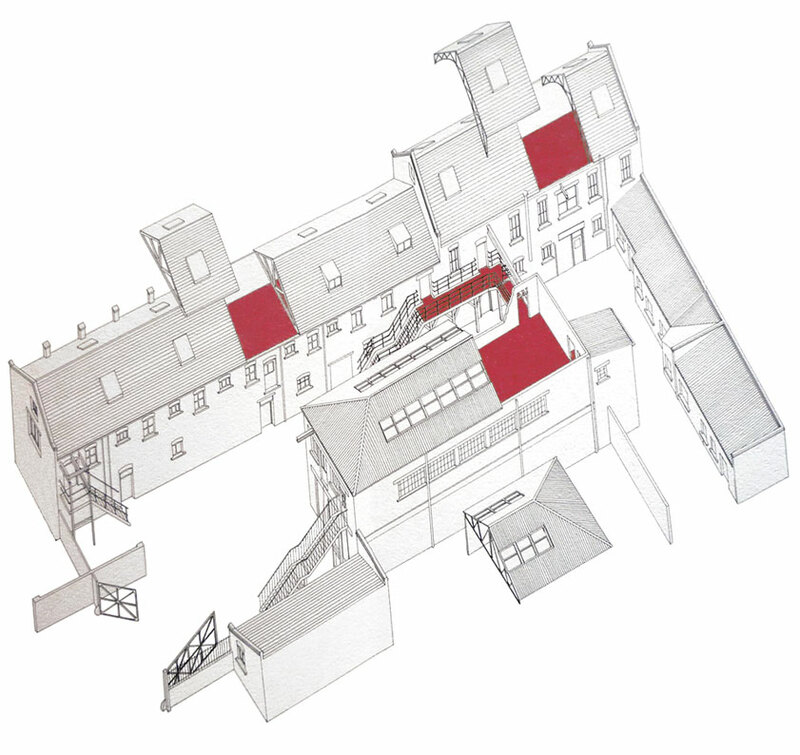 The contents of the present 10 feet high vault (stretching along the entire length of the long building, on the left) can then be transferred to its original 14 feet high racking, across the yard, into the Elephant House. The racking will hold the 23,000 drawers, in 300 languages, of Monotype patterns (600,000), punches and matrices, in numberless typeface designs and devices. The Stephenson Blake materials will accompany them, into the new vault. We are fortunate to have the support of the Prince's Regeneration Fund in our regeneration work at the Type Archive. Trustees are now turning to the public, and appropriate international institutions in the UK and abroad, for help in funding this regeneration venture. Whether it be a bank; full or partial sponsorship by a charity group or individual; an engineering giant serving the world; a publisher or publication with global reach; an enlightened trade union in tribute to the centuries of toil represented by the Type Archive : we need to hear from you. Full details of the site are available. We are well served by underground trains at Stockwell, the Oval and Brixton (Victoria and Northern lines). Bus services to and from every London main line station currently run direct from 3 minutes away : numbers 3, 59, 133, 159, 415.